We’d love your help. Let us know what’s wrong with this preview of The Power of TED by David Emerald. To ask other readers questions about The Power of TED, please sign up. David Emerald’s simple, powerful fable, The Power of TED*, (featuring his uber-wise character, TED) is a life changing kinda book. There are two (very) different orientations from which we can choose to live: Victim and Creator. One’ll land you in the Dreaded Drama Triangle (DDT) and the other’ll place you squarely where you want to be: in The Empowerment Dynamic (TED). 1. Dreaded Drama Triangle - It’s poisoning us! 2. The Victim - Requires a Persecutor. 3. The Persecutor - Requires a Victim. 4. The Rescuer - Saves the Victim! 5. The Antidote to DDT - The Empowerment Dynamic (TED*)! Here’s to living these questions and Creating our ideal lives. I loved this book! Be forewarned this book is written in a narrative style. In the beginning I kept expecting them to reveal someone as an angel or alien! Yes I guess a story format makes it more interesting to the casual reader. At times I wish I could have had a cliff notes or outline format to cut to the chase. The principles were so powerful and I'd been introduced to them in short form not narrative and really wanted to cement them in my memory and the story packed a lot of words around the I loved this book! Be forewarned this book is written in a narrative style. In the beginning I kept expecting them to reveal someone as an angel or alien! Yes I guess a story format makes it more interesting to the casual reader. At times I wish I could have had a cliff notes or outline format to cut to the chase. The principles were so powerful and I'd been introduced to them in short form not narrative and really wanted to cement them in my memory and the story packed a lot of words around the principles that seemed distracting at times. This is why I give four stars. The principles and potential for life transformation are 5 stars, the telling of the tale is less for me. It could be tempting for some to read the book and feel it's completely an attraction concept (ala The Secret) but I see it as much more and useful for even those who find the attraction view as oversimplified hooey. Please don't reduce these concepts to fiction. They are powerful and potentially life changing. I use the principles in my coaching work often and am working to use them daily in my own life. To shift perspective from the Drama Triangle where I am a victim, persecutor or rescuer to The Empowerment Dynamic of creator/co-creator, coach, challenger. Good message told in a bit of a gimmicky parable. People who identify as spiritual may enjoy very much. Worth a read, but I wouldn’t expect miracles. The Empowerment Dynamic is about taking ownership of your life, specifically through the way you frame your life and your focus. So the book is a bit derivative – this isn’t a groundbreaking concept. But David Emerald’s work has captured the imagination of many – and frankly, I don’t see why. The author offers this book as “part autobiography and part fiction”. That isn’t typically what I look for in a self-help book. Instead of introducing a new paradigm for visualizing success or happiness in The Empowerment Dynamic is about taking ownership of your life, specifically through the way you frame your life and your focus. So the book is a bit derivative – this isn’t a groundbreaking concept. But David Emerald’s work has captured the imagination of many – and frankly, I don’t see why. The author offers this book as “part autobiography and part fiction”. That isn’t typically what I look for in a self-help book. Instead of introducing a new paradigm for visualizing success or happiness in one’s life, this is a trite explanation (not exploration) of a pretty general concept. The reader isn’t walked through a system of thoughts, but instead is basically told to choose to be happy. The tone is juvenile and often condescending and the details are lacking; this book offers little insight on how to apply the concepts and reads as if the intended audience was troubled adolescents. Lip service is paid to the difference between choosing to be a victim and actually being victimized, but the commentary seems to be that it is still up to you to choose whether or not to be happy with your lot in life, even when circumstances beyond your control do render you powerless. After promising a paradigm-shift, we instead get platitudes and a pretty amateurish delivery that makes the whole thing seem overly contrived and sickly sweet. The constant repetition of the Dreaded Drama Triangle and the roles of that and TED (The Empowerment Dynamic) become annoying in their smarmy triteness and start sounding more and more like a cult mantra, leaning more toward indoctrination than any self-actualization. If you are really in a place where you want to feel better about your life and relationships and are ready to make a change, go read "Getting to Yes" or something, instead. This was 160 pages that I had already seen pretty well summarized in a ten minute Powerpoint presentation. There are people in my life that have found this to be a transformative book/dynamic, but for me, the "part autobiography and part fiction" approach the author took minimized some of the dynamic's power. I would have preferred less fiction and more details of how one can actually implement the creator approach. I don't know why I continue to read these silly things-except managers seem to be into this nonsense. There is a lot to think about after reading the power of TED. 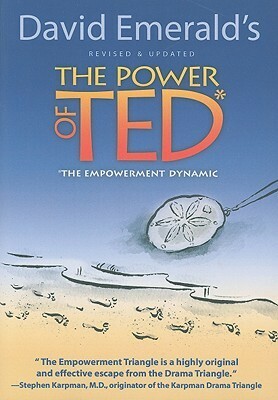 Ted in this book is a person and a reference to what David Emerald calls The Empowerment Dynamic. This book challenges how we view what happens in our life and helps us change how we react by changing how we perceive the events and people in our lives. Mostly the focus is on how we can stop viewing ourselves as victims and convert ourselves to creators. The drama triangle contains three types behaviors, victim, rescuer and persecutor. Th There is a lot to think about after reading the power of TED. This book explains how to flip the switch from the drama triangle to a more empowering one. You switch the role of victim to creator, from rescuer to coach and from persecutor to challenger. The book, through a story explains the process using the characters. David, Ted and Sophia with their various stories about their personal lives and how TED changes thier lives. This book is highly readable, but to get the most from it you will need to actually go through it more than once. There are a lot of concepts that need to be re-read to be fully understood. This handy manual is written as a story of a man who encounters Ted (and later Sophia) along the beach. He's in a full-blown life crisis, and Ted explains the concept of TED (The Empowerment Dynamic), which is the antidote to the DDT (Dreaded Drama Triangle). Unfortunately, many of us go through life as victims rather than creators. This book explains these concepts thoroughly, and encourages us to examine how we might shift our thinking to improve our relationships, careers, and everything else This handy manual is written as a story of a man who encounters Ted (and later Sophia) along the beach. He's in a full-blown life crisis, and Ted explains the concept of TED (The Empowerment Dynamic), which is the antidote to the DDT (Dreaded Drama Triangle). Unfortunately, many of us go through life as victims rather than creators. This book explains these concepts thoroughly, and encourages us to examine how we might shift our thinking to improve our relationships, careers, and everything else in life. On my coaching journey I look out for ideas / concepts that are new to me. Since I'm at the start of my journey and know little there is a lot to learn. Last week I was reading a book on VUCA and that's where I came across some new coaching concepts such as Equine Coaching and of course TED* - yes its a clever name as its not about the TED talks but something else as impactful. I'd never heard about the Power of TED* nor the DDT and its a great discovery and I wonder why its not more popularly kn On my coaching journey I look out for ideas / concepts that are new to me. Since I'm at the start of my journey and know little there is a lot to learn. Last week I was reading a book on VUCA and that's where I came across some new coaching concepts such as Equine Coaching and of course TED* - yes its a clever name as its not about the TED talks but something else as impactful. I'd never heard about the Power of TED* nor the DDT and its a great discovery and I wonder why its not more popularly known. 1.5 stars rounded down. I hated the fable format of this book. It felt shallowly executed yet also too verbose. There are a few good ideas in this book (thus the 1/2 star), but they are better written in MANY other books. I skimmed to the end to finish reading for a bookclub. My husband and I read this book out loud together so we could apply the principles together. We've had fun joking around about turning all things into acronyms. And the information contained in the book really is brief enough I believe it could easily fit in a 10 page pamphlet. But my husband liked the beach scenario. This little book can be a life changer. It is simply written in parable style, a quick read, and teaches deep perspective changing concepts. The writing style is very basic, by the message is inspiring and powerful. This was an interesting read and surely had a lot of insight in just a few pages. I enjoyed the challenges that are given throughout and plan to try and implement them in daily life. This will be a good book to refer back to occasionally. Simple but powerful and practical concept. You're able to apply the basic principles before you even finish it. I appreciated the concepts being posed in a visual story instead of the typical over-zealous "manifest your dreams" bla bla. The content is good, but it's sufficient to read the summary in the appendix. Good stuff here, but it's overshadowed by the commercialized presentation. Fantastic self help book to lift one out of the “drama” almost instantly if followed, or at least makes one self-aware of the corruption of personal drama! A must-read. Reframes life a strife in a powerful, down-to-earth way that is easy to understand and implement with enormous potential. Quick read. It's a fast read but with a powerful message about how you can interact in the world. It was good information, but not life changing. I liked his illustrations and it will help refocus some of my thoughts in the future. Now to apply it....great book. I love how he used stories. I was enlighted and feel like he is spot on in his assessments. Wow. This book really hit the mark. An excellent way to approach and navigate relationship dynamics. It's worth a second read. This book was amazing! I realize it is difficult to find, but I suggest it to anyone who would like to find greater meaning in their struggles. I bought this for Kindle and it was well worth it!